Elected now for a three year term as president of the Bharatiya Janata Party starting in November 2006, Rajnath Singh knows that his immediate task is ensure a BJP win in the coming Uttar Pradesh assembly elections that sends 80 members to the Lok Sabha. If UP is with the BJP, its chances of once again sitting on the throne in New Delhi will get brighter. His task of infusing a new energy in the party is not going to be easy. The cadres are demoralized. There is the growing mistrust and one-upmanship in the organization. The treasury is not as fat as it was when Pramod Mahajan was alive. He was the main fundraiser and with him gone, the party is groping around to find someone who can do the job. Making it worse is the image of the Congress that is getting better and better by the day with Dr. Manmohan Singh at the helm. The economy is growing. There is a feel good factor in India today. Many NRI's are returning to set up shop back home. In a desperate move, Rajnath has brought the issue of Ram temple at Ayodhya to the forefront once again. He hopes to cash on it for the UP elections. He reiterated the BJP's commitment to construct a "grand Ram temple at the disputed site in Ayodhya". The Ram Mandir is not an issue in the public mind anymore. The young want jobs, they want opportunities, they want a good quality of life. There is a new demand for progress and development. Many see that India is on an ascending path of economic growth and do not want communal conflagration to ruin it. There are growing aspirations among the middle class and even the poor. But the BJP is yet to read this kind of writing on the wall. In many ways, it is ironical that its leaders cannot read the public sentiment that is all too obvious. If Rajnath has to make a dent, he better see the writing on the wall. India is a young nation and will soon have the largest number of youngsters in the world. They have aspirations and want to be living in one of the best countries of the world. A temple does not matter to them. If he took a walk into any campus in India, he would realize this. They are looking eagerly at growth areas. They need money to feed a greedy lifestyle. They are not interested in communal politics. But he is the best man that the BJP could have had at the top. Former Prime Minister, Atal Behari Vajpayee and former deputy Prime Minister, Lal Kishan Advani, are seen as retired though they want to be at the helm. Advani still has hopes that he would be Prime Minister one day. What everyone is asking is whether Rajnath can deliver? For the BJP desperately wanting to make a comeback both in Uttar Pradesh this year and later at the centre, this is a question that vexes his party men who are obviously uncomfortable out of power. Rajnath had one quality few had. He was the most acceptable. Even the RSS had no problem with him. His public relations with both the RSS and the VHP were superb. As soon as he took over, he went and met both the RSS and VHP leaders who of late were not too happy with both Vajpayee and Advani. He had the ability to talk to warring leaders and keep the peace with all of them. He can talk to them at various levels be it Shatrugan Sinha, Yashwant Sinha, Murli Manohar Joshi, L.K. Advani or Kalyan Singh. For a leader in his mid-fifties, it was no mean feat as Gen Next of the BJP wait in the wings to take over and give the party a new face. A section of the party feels that it was time for the BJP to break free from the RSS. It's leaders even hinted at how interference from the oldies in the RSS were giving the party a hard-line image. But Rajnath had no qualms when he said: 'I am a RSS swayamsevak. I have no hesitation in consulting the RSS. We stand to gain from their advice and experience.' This must have sounded like music to the RSS who of late felt that the BJP was growing too big for its boots and were veering away from the Hindutva agenda. Again, his statement soon after takeover that a Ram temple was very much on the agenda of the BJP and it wanted this to happen as soon as possible must have made the RSS and the VHP rub their palms in glee. They hope that the Hindutva movement, which was swept under the carpet during the NDA years, would once again be revived. As things stand, the organizational secretary of the BJP is likely to be a RSS nominee. Has the Advani era ended? Advani said that the party lost a great opportunity of not accepting his; 'Jinnah was secular' refrain that would have made the party more acceptable as far as vote politics was concerned. By raising all the core Hindutva issues like the Ram temple, Uniform Civil Code, abrogation of Article 370 of the Constitution and infiltration from Bangladesh, Rajnath in many ways signaled a return to the ideology that the erstwhile BJP shared with the RSS ten years ago. His four-point strategy for success for the party is: restraint at the individual level, coordination at the organizational level, struggle at the political level and service at the social level. Only this four-pronged formula would help the BJP parivar succeed he felt. As a former agriculture minister, Rajnath can also easily see that the party needs to lend their shoulder to the farmer who is today sinking in a whirlpool of debt and despair. Agriculture has to be given impetus. Irrigation has to improve, better quality seeds need to be sourced, Indian fields have to be rid of an excess of pesticide and farmer friendly policies have to be designed. A country like Brazil makes sure that 80 per cent of its farm produces is processed. Despite being an agricultural economy, India processes only 20 per cent of its produce! He needs to talk of change, he needs to inspire, he needs to lead from the front and ultimately, walk the talk. 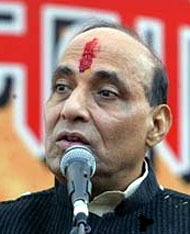 Rajnath will do well to lead the party from the front giving it a new direction. 'India Shining' was a slogan that drove the first nail into the BJP coffin. For the majority of Indians who live on the sidelines of life, it was not shining at all. They do not read the pink papers and then decide whom to vote for. India today is looking at development. The way Laloo Prasad Yadav's party was routed in the last Bihar elections was proof enough. Overcome with emotion after his elevation as president last year, Rajnath said that he did not understand people who suggested that a hospital or school be build instead of the Ram Mandir. But he must try to understand that what people need today is health services and education. When he was the organizational secretary of the Akhil Bharatiya Vidharthi Parishad of the Gorakpur division in Uttar Pradesh in 1961, the India he saw was different. Today, the color of politics is rapidly changing. Just being a good PR strategist balancing the odds in the party is not enough. With his image, he has earned the nickname, 'Chanakya' as he is the master of intrigue. Just see what his party did in Karnataka soon after he took over the party affairs. The Congress was unseated. Advani ignored the RSS and it proved to be his nemesis. Rajnath knows better and has managed to keep the RSS with him. Maybe, the Ram Mandir issue is just to keep them happy. The real challenge for Rajnath would be to unify a fractured party, infuse some energy into it, help it to dream again, manage the contradictions between it and the RSS and slowly consolidate his position in the party where many are looking at prospects in the next Lok Sabha elections. If the BJP wants votes, they better start looking at a strategy where they can build India into a developed nation. The temple can wait.